1(1) For the purposes of section 3(d) of the Act, the prescribed distance from a doorway, window or air intake of a public place or workplace is 5 metres. (2) For the purposes of section 3(d) of the Act and this section, “window” means a window that can be opened to admit air. 1.1 For the purposes of section 3.1 of the Act, “school building” means a school building within the meaning of the School Act, including the related school grounds and parking lots. (e) barter or deposit with another person for the performance of a service. 1.3(1) In this section, “additive” means an ingredient other than tobacco leaves added to a tobacco product, its unit packet or any outside packaging. (b) is noticeable before or during the use of the tobacco product. (4) No tobacco product shall be determined to have a characterizing flavour solely because of the use of additives or flavourings. (c) be clearly visible to persons entering the public place, workplace or public vehicle. (ii) be set out on a contrasting background that makes the text clearly legible in whatever lighting is used in the public place, workplace or public vehicle. (b) in such a manner that the sign is conspicuous and not obstructed from view and is clearly visible to an individual working in the capacity of a sales clerk. (v) must be surrounded by a red border that is 1 cm to 1.5 cm wide along the edges of the sign. (b) be clearly visible to persons entering the room or place. (ii) be set out on a contrasting background that makes the text clearly legible in whatever lighting is used in the public place or workplace. 4(1) For the purposes of section 7 of the Act, a sign posted in a public place or a workplace other than a work vehicle must be at least 20 cm by 26 cm and must have a surface area of not less than 520 cm2. (2) For the purposes of section 7 of the Act, a sign posted in a public vehicle or work vehicle must be at least 10 cm by 10 cm and must have a surface area of not less than 100 cm2. (h) signs may include the name and price of a tobacco product but may not contain any other wording, pictures, logos or other illustrations. (e) any other documentation that is issued by the federal government or a provincial government or a foreign government. 6(1) The Minister may appoint inspectors or designate any person or class of persons as inspectors for the purposes of the Act and this Regulation. (2) A peace officer within the meaning of the Provincial Offences Procedure Act is also an inspector for the purposes of the Act and this Regulation. (3) An inspector appointed or designated pursuant to subsection (1) who enters a place or premises for the purposes of the Act or this Regulation must on request show evidence of his or her appointment or designation to the person in charge of the place or premises. (i) subject to the Provincial Offences Procedure Act, issue violation tickets under Parts 2 and 3 of that Act. 7.1(1) Section 3.1 of the Act does not prohibit an Aboriginal person under the age of 18 years from possessing, smoking or otherwise consuming a tobacco product or holding a lighted tobacco product if the activity is carried out for traditional Aboriginal cultural or spiritual purposes. (2) Section 3.1 of the Act does not prohibit a non‑Aboriginal person under the age of 18 years from possessing, smoking or otherwise consuming a tobacco product or holding a lighted tobacco product if the activity is carried out with an Aboriginal person and for traditional Aboriginal cultural or spiritual purposes. 7.2 Despite section 3.1 of the Act, the possession of a tobacco product by a person under the age of 18 years for the purpose of enforcing or ensuring compliance with any enactment prohibiting or restricting the sale of tobacco products to persons under the age of 18 years is not prohibited if such possession is authorized by a person whose duty it is to enforce or to ensure compliance with the enactment. 7.3(1) To avoid any doubt, an employee who is under the age of 18 years is not in contravention of section 3.1(2) of the Act when that employee holds, gives, carries or otherwise handles a tobacco product while on duty and working in the capacity of an employee. (2) Despite subsection (1), if an employee who is under the age of 18 years smokes or otherwise consumes a tobacco product anywhere on the premises where he or she usually works, whether on duty or not, that employee is in contravention of section 3.1(1)(a) of the Act. 8(1) An inspector may seize any tobacco product or sign or any other thing that the inspector believes on reasonable grounds constitutes evidence of a contravention of the Act or this Regulation. (2) An inspector may remove the thing seized or may detain it in the place where it was seized. (b) provide the person with a receipt for it. (4) An inspector who seizes anything under the authority of the Act or this Regulation shall deal with the thing in the same fashion as if the thing were seized under the authority of a search warrant. 8.1 When a person is not convicted of an offence under the Act, a justice may make an order concerning the disposition of any tobacco product seized in relation to that alleged offence. (b) to be returned to the person from whom it was seized or to any other person entitled to possession of it, subject to any terms or conditions imposed by the court. (2) Where a thing is forfeited under subsection (1), the Minister may dispose of or destroy the thing and the costs of the forfeiture and disposal or destruction are recoverable from the offender. (d) “designated cigar” means a cigar that has a cigarette filter or weighs more than 1.4 grams and less than 5 grams excluding the weight of any mouthpiece or tip. (e) blunt wraps — 20 units. (d) tobacco‑related products, including cigarette paper, matches, lighters, cigar and cigarette holders, pipes, pipe cases, pipe cleaners, pouches and humidors. (2) Sections 7.1 and 7.2(1)(a) of the Act do not apply to a tobacconist if minors are prohibited from entering the tobacconist’s retail premises. (3) Despite section 7.2(1)(b) of the Act, a tobacconist may display a sign visible outside the tobacconist’s retail premises that indicates the name of the tobacconist’s business. 10.1(1) In this section, “lodge accommodation” means a lodge accommodation as defined in the Alberta Housing Act. (c) has a separate ventilation system. 10.2(1) In this section, “cigar” means cigar as defined in section 9.1(1)(c). (c) repealed AR 240/2007 s10.2. (3) Subsection (2)(c) is repealed on September 30, 2015. 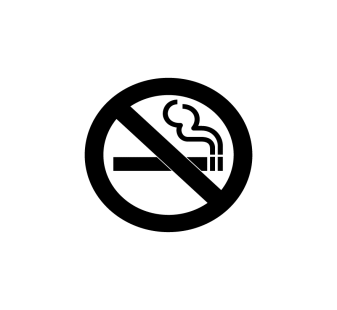 11 The Smoke‑free Places Signs Regulation (AR 207/2005) is repealed. 12 For the purpose of ensuring that this Regulation is reviewed for ongoing relevancy and necessity, with the option that it may be repassed in its present or an amended form following a review, this Regulation expires on October 31, 2021. 13(1) This Regulation, except sections 5 and 10, comes into force on January 1, 2008. (2) Sections 5 and 10 come into force on July 1, 2008.